I had fun making these tonight, I thought I would share! 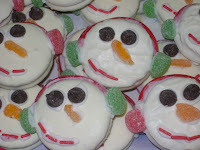 You use the white fudge covered Oreo cookies, chocolate chips, gumdrops, red licorice, red sprinkles. I couldn't find the Oreo cookies in the grocery stores. I found them at K-Mart, someone else told me they had them at Wal-Mart as well. 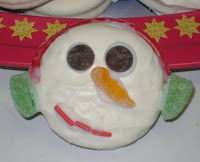 I used the Wilton cookie icing that comes in a bottle that looks like a glue bottle. 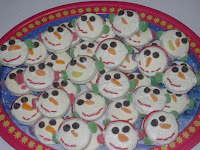 What adorable cookies! I have such a sweet ooth that I can easily eat them up..lol. I wish I had time to make cookies. So glad to visit you. Your blog is adorable too. Have a great weekend.